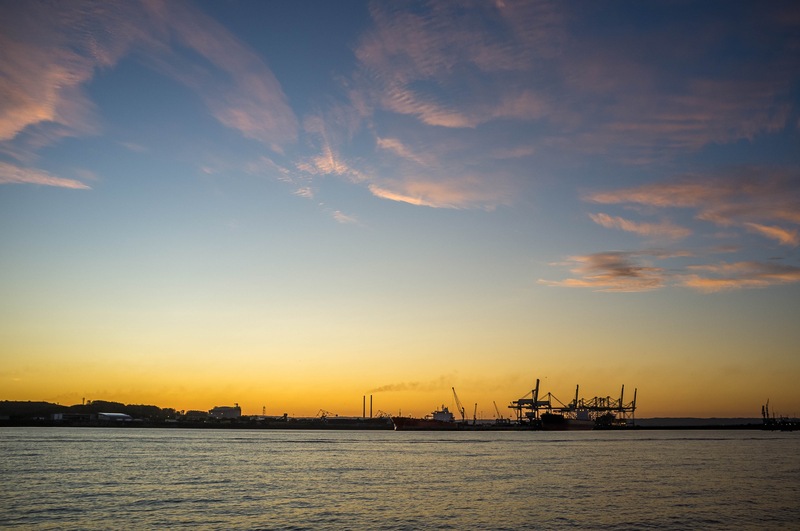 Leaving Lisbon, we made our way down the Rio Tejo and revisited most of its sights - the Hummingbridge, the Torre de Belem, museums and monuments. At the bend, a large cargo ship came up the river while we were sailing downriver. We worked out that the ship ought to make a turn to starboard to catch the bend in the channel pretty soon, so we kept sailing straight. It soon made a sound signal at us, but because it was very windy, we couldn't tell if he'd tooted once (signalling he was going to turn to starboard as expected) or twice (signalling an unusual turn to port to avoid a collision). I was fairly sure it was twice, Elvyra heard once, so to avoid a collision I decided to tack to port. Turns out I must've misheard, because the ship turned to starboard, at the glacial speed that ships turn at. Oops. 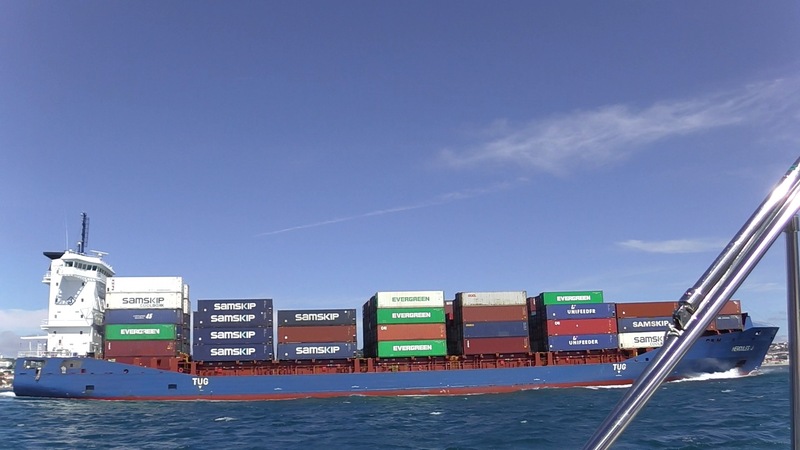 We were now well in the path of a massive steel cargo ship steaming upriver at 12 knots and us going about 5.5 knots down, so not much time to react. We were still a bit on his starboard bow and heading that way anyways, so I decided we'd best get the heck out of the way, fired up the engine, bore off the wind some more and sprinted out of the channel at 90 degree to their course at best speed. We made it and got a nice photo of him, but I'm sure there was some swearing about bloody yotties happening in their control room. Perhaps it'd would've been wiser to ask them on the radio about their intentions (or trust Elvyra's hearing), but I could've sworn I heard him toot twice. In hindsight, it was probably the brim of my hat flapping over my ear in the strong wind that made it sound like that. Pretty rubbish excuse if you end up hitting a ship though. Caves in the cliff on the way to Sesimbra. After that, we headed south and sailed around Cabo Espichel to Sesimbra with plenty of wind, waves and dolphins racing us. Dropped anchor off the beach there next to some moorings. We'd planned to spend two nights there, waiting out some wind and big atlantic swell coming our way. 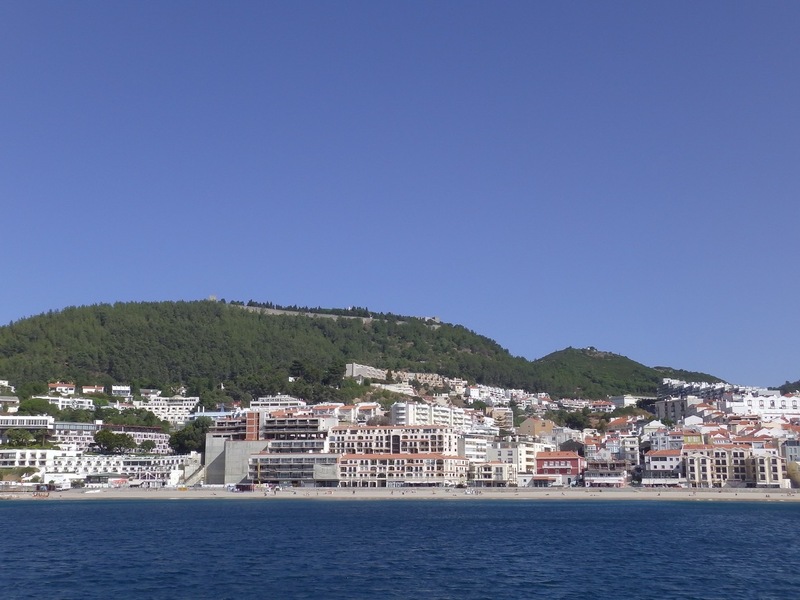 Unfortunately Sesimbra was a terrible anchorage, with winds over 40 knots coming off the mountain there and the boat veering around at anchor all night. Not much sleep was to be had and despite the lousy forecast we decided to go on to Sines, which offered much better shelter. 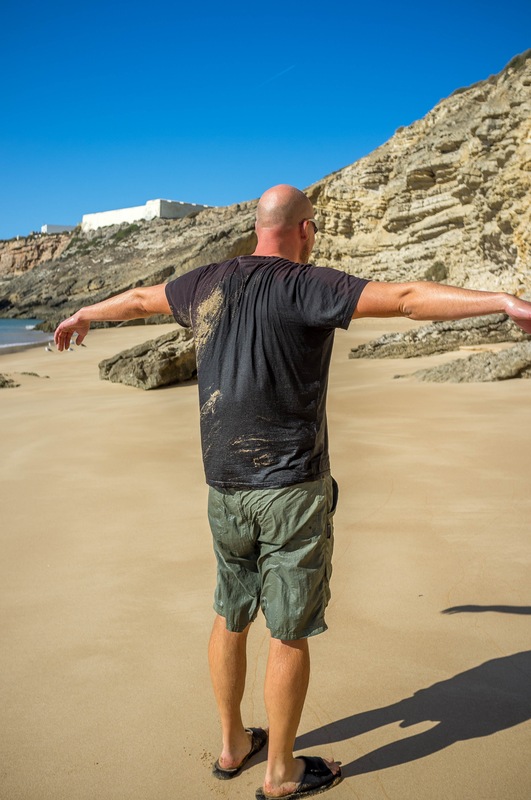 We gained much confidence in Mr. Rocna at Sesimbra. Sandy bottom, gusts over 40 knots, boat veering around. This made for a rather exciting sail during which we'd gotten the boat wet with flying saltwater all the way up to the boom, and both sides of it at that. Elvyra now gets nervous when I say things might get exciting. 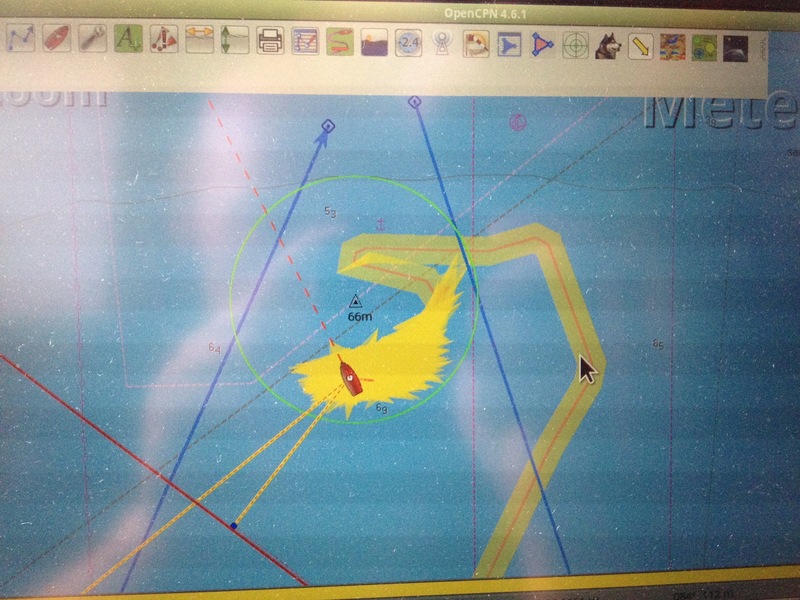 We were heading downwind with the max recorded wind speed at 38 knot and the swell was 3-4m. This went fine until we arrived at Sines, which has a large harbour promising good shelter. Unfortunately a large cargo ship was just arriving before us and struggling with the wind and seas, so three tugboats worked together to slowly push it into the harbour, while we had to sail around outside the sheltered breakwater until the thing was moored and out of the way. We got pretty wet and salty for that last bit of the trip. Once inside the breakwater, things quietened down immensely and we puttered into a pretty full anchorage at Sines, did a scouting round waving at other cruisers and found a corner with room for us next to the buoyed swimming area. The first thing you see (and smell) entering Sines is a big refinery. First impressions are misleading here - the place offers an excellent anchorage on a nice, clean beach. Sines was worth the icky trip, the anchorage had excellent shelter from the 40 knots blowing outside the harbour, no swell and a beach complete with paddleboarderesses in string bikinis. The water was a little bit cool for swimming at around 15°C. Perhaps because it was already mid September, but mostly because the west coast waters are too rough to heat up much outside sheltered areas like the Spanish Rias. We spent two nights at Sines to wait for these rough seas to die down below 3m so we could turn the corner of Cape St. Vincent relatively unmolested. This was going to be a long trip by our current weakling standards, about 65 miles from Sines. We'd regularly done much longer passages in the English channel, dictated by the strong tides, short weather windows or daylight arrivals, but since the leisurely cruising of the Rias and the short daylight hops of around 35 miles on the Portuguese west coast, we've definitely become spoiled and a 65 mile passage now counts as a longish trip. This part was fairly uneventful, the swell was back down under 3m, there was no wind at the start and just enough to motorsail for most of the part. Plenty of dolphins accompanied us again and provided entertainment by jumping out of the back of waves. 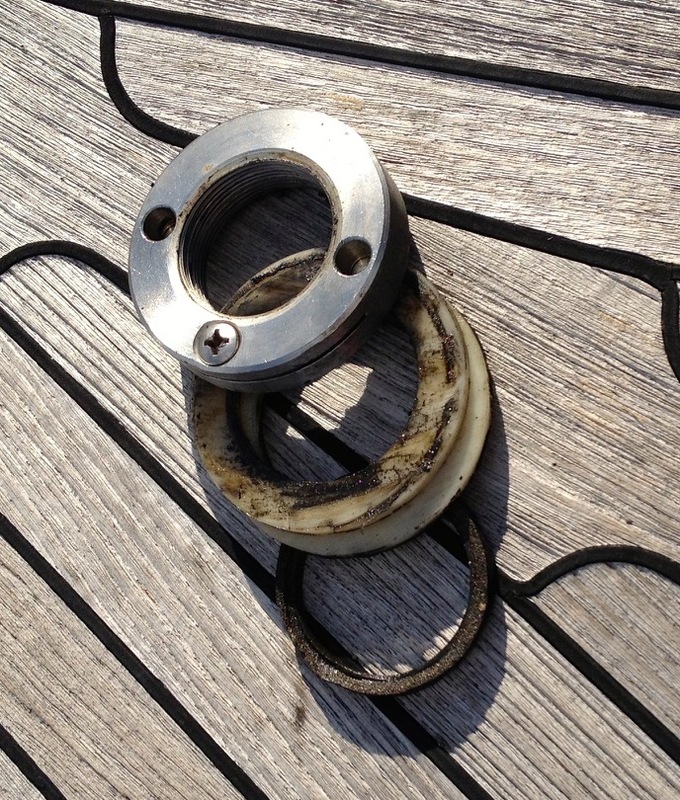 Top nut with locking screw and nylon washers (archive photo from 2015 refit). Well, not entirely uneventful. About midway I noticed a squeaking sound coming from the back of the boat. After much fiddling around the stern arch and transom area I determined it was coming from below, in the area where the steering gear was working. Uh oh. I went below, laid on the bed and opened the access hatch there and soon found the problem. The quadrant was rubbing on the bottom frame of the metal bracket it turns in. Hmm, odd. Had the quadrant slipped down? Nope, the Tefgel between it and the rudder post showed no signs of having moved. Was the bracket coming off? Nope, nothing loose there. That left only one thing - the rudder post must've dropped downwards. Either from wear of the nylon washers below the top nut, or from the top nut loosening a bit over the 1500 miles we'd done, mostly in atlantic swell. I went back on deck and unscrewed the stainless steel "teacup" covering the top nut. The nylon washers looked fine and no thinner than a year ago when I'd put them there. So the top nut must be a bit loose. Tricky to tighten underway, as the rudder was much needed to keep steering in the swell. We could heave to, but the problem wasn't super urgent. The rudder couldn't fall out of the bottom of the boat (the quadrant would prevent that) and steering was working fine and not going any harder than usual. So I grabbed a syringe loaded with grease from the toolkit and squirted some between quadrant and bracket. This immediately stopped the squeaking and wear from metal rubbing on metal and we only had about 20-25 miles left to go at that point. 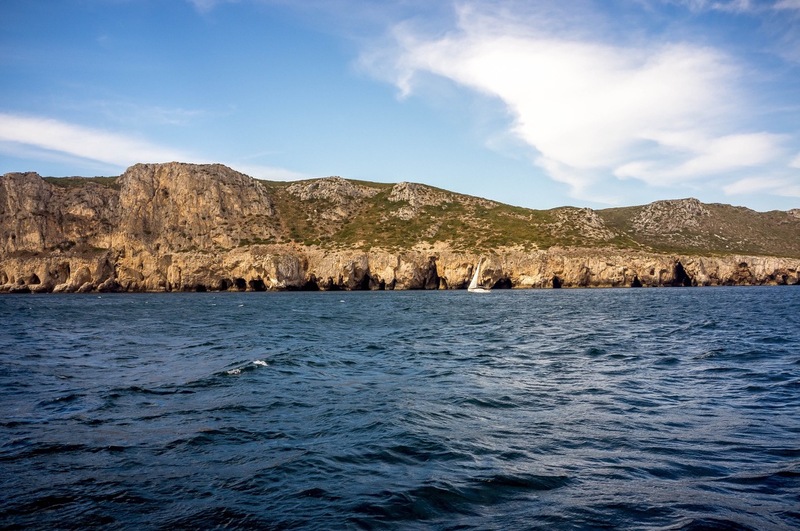 After that we rounded the cape, had a brief fun sail when the wind blew around the corner a bit and were the second boat to arrive at Sagres, the first anchorage after turning the corner. A cool thing happened here, of which I unfortunately have no video: Whenever we made any sudden noise or vibration, like dropping the anchor or revving the engine to dig it in, an outwards ripple of many hundreds of jumping fish spread out from our boat all the way to the beach. Having stopped, I grabbed the toolkit from the engine room, undid the locking screw at the rudder top nut and tightened it up until the quadrant was clearing the bracket again. Much easier to do when not underway. The locking screw had been decidedly loose, which probably caused the top nut to slowly unscrew with rudder movements and drop it a few millimeters until the quadrant touched the bracket and started squeaking. I applied some blue Loctite to the lock screw to prevent this in the future. Problem solved! It's good to listen to your boat. Every unusual noise is the boat trying to tell you something. 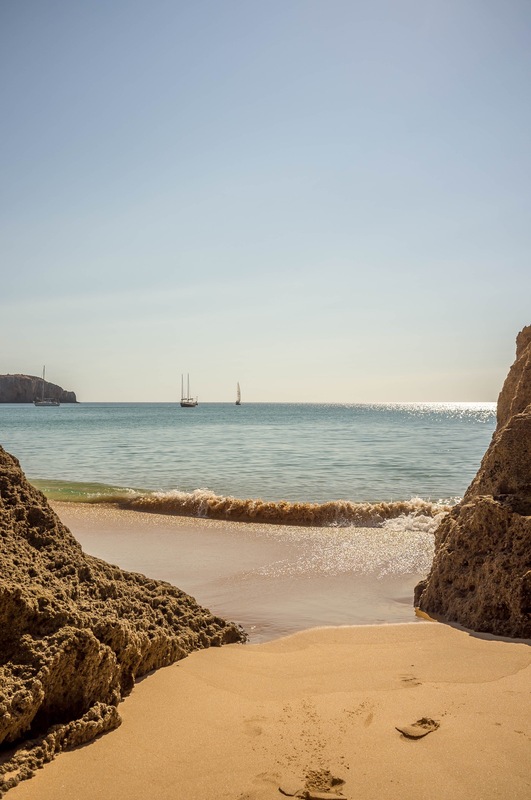 We had rounded the southwestern corner of Portugal (and Europe) and arrived in the Algarve. 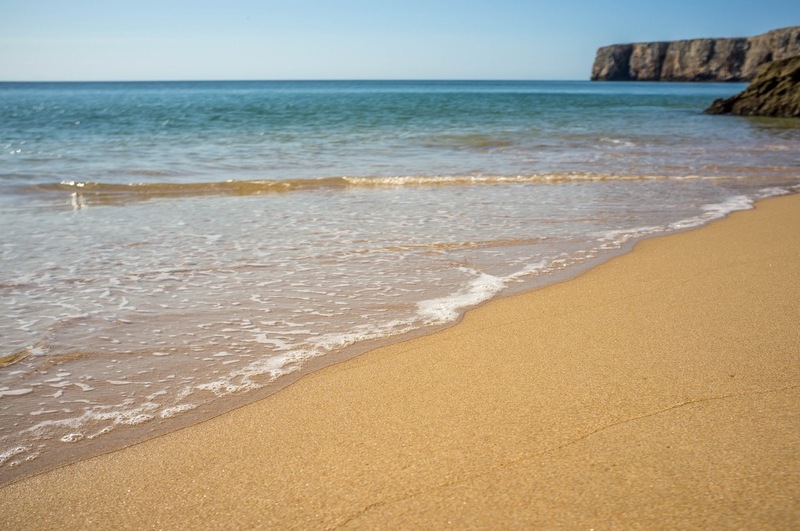 Sagres had two beaches, one with a path to the town full of umbrellas and people, and one accessible only by sea or by climbing across a pretty steep cliff. We assembled the dinghy and rowed to that one. It was empty. Better yet, it was devoid of footprints. There was a slight surf going and when I excitedly jumped out of the dinghy I promptly fell over backwards with a big splash, yelling at Elvyra to rescue my flip-flops from floating away. We dragged the dinghy up the beach and since I was already wet and covered in sand, I walked into the sea to wash it off and swim a bit. Elvyra soon followed. The water was pretty chilly and we didn't stay in long, but having our private beach was great. Songbird on the far left in front of a cliff. Elvyra's photos are for sale by the way - see the About page for contact details. 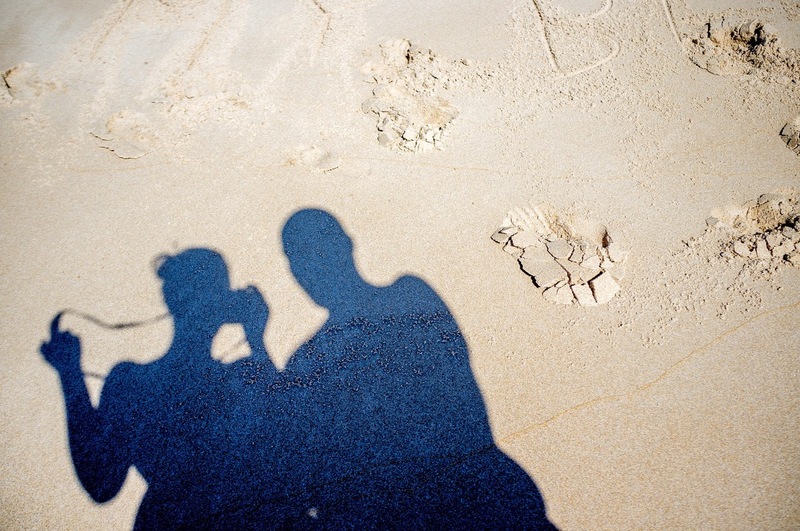 Shady characters on my beach.